PALMDALE – The city of Palmdale is accepting applications for participation in the third annual Kaleidoscope Music & Art Festival, a unique event dedicated to the arts, coming to the Palmdale Amphitheater on Saturday, Oct. 13. Applications are available online at www.PalmdaleAmphitheater.com. Professional Artisans & Artists – Professional artists will have the opportunity to display, demonstrate and sell their work in their own booth space. Deadline to apply is Sept. 15. ARTLIGHT Student & Novice Artist Exhibit – Novice artists and hobbyists are encouraged to apply to display at ARTLIGHT, a place for aspiring artists to display their work; open to groups, classes, schools, art instructors and individuals. Deadline to apply is Sept. 15. Apothecary & Culinary Artisans – Kaleidoscope’s Fresh Made Market is perfect for cottage industry and farmers market vendors who specialize in handmade candles, home scent products, skin and body care products, baked and canned goods, salsas, pestos, sauces and traditional farmer’s market products. Deadline to apply is Sept. 15. 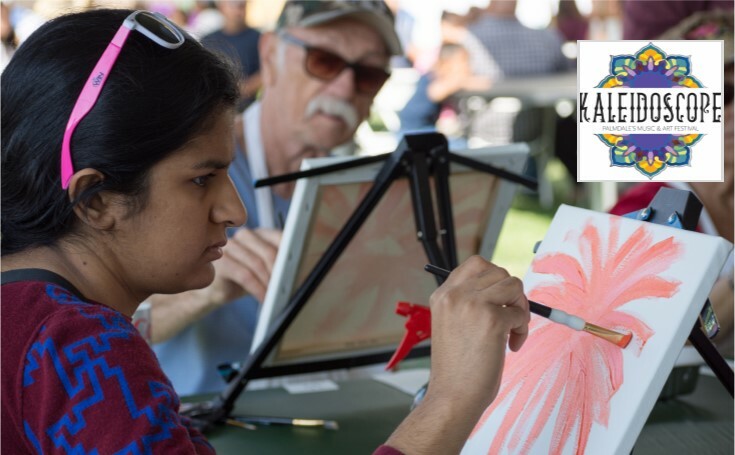 Art à la Carte – Local businesses or organizations that are hosting music or art events from Oct. 5 to 12, the week prior to Kaleidoscope, may qualify to be included in Kaleidoscope’s Art à la Carte brochure. Deadline to apply is Sept. 15.